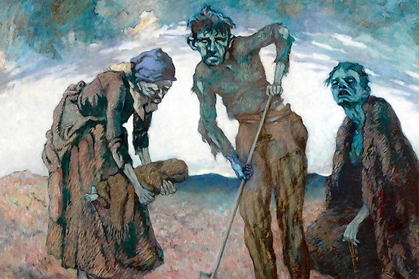 There is a painting in the new Ireland’s Great Hunger Museum on the campus of Quinnipiac University in Hamden, Connecticut by Lillian Lucy Davidson a 19th Century-born artist of the Irish Famine, showing a haggard man and his wife and an older woman burying a baby. The scarecrow look on the faces, the wild-eyed intensity the hopeless posture of the three and the little brown bundle of the dead baby form a perfectly compelling self-contained narrative for what happened to millions of Irish during the Irish Famine. You know looking at them they too are not long for the world, and yet these wild eyed scarecrow creatures are our kith and kin, an earlier generation doomed to the most horrible of deaths, many forced to eat grass and leaves in desperate attempts to survive. Little wonder that when you step into the new Great Hunger museum near the campus of Quinnipiac University in Hamden, Connecticut you are almost entering hallowed ground. This is as close as you will come to their pain, to their experience, to their tragedy. And yet as Gerry Adams stated in a lecture there this week, the fact that the Irish culture survived showed we were “no mean people’ that despite the attempt at genocide of the Irish by the British between 1845 and 1848 the people endured and thrived. Suffice to say that the great-grandson of one of those similar scarecrow-like creatures who escaped to America became President of the United States a little over 100 years later. The museum was officially opened by Irish Tourism Minister Leo Varadakar on Friday, accompanied by many Irish and Irish American dignitaries capping an extraordinary achievement by one driven man. Quinnipiac University President John Lahey created the concept of the museum and took it from the drawing board to the spectacular building it is today. On two floors replete with both modern and Famine era art and artifacts we see the oncoming peril, we experience the devastation, the flight to America and the changed landscape for evermore of Ireland. It is all there in a beautiful stained glass window by Robert Ballagh depicting the onset of the Famine in the extraordinary work of sculptor John Behan and Rowan Gillespie depicting the emigrants on the crowded and diseased ridden ships and in work from countless other artists and artisans. The onset of Famine is shown in the letter of an Anglo Irish woman in the West of Ireland informing a friend that the potatoes have failed in their parish and they hope the same has not happened to them. The inquiry is cursory, with no hint of the horror to follow. Then during the full fury of the Famine we read the minutes of the Board of Guardians of the town of Killarney in Black ’47. The museum is the dream and reality of President John Lahey of Quinnipiac, a former New York Parade grand Marshal who dedicated his term as grand Marshal in 1997 to the Great Hunger and has now created this permanent memorial to Ireland’s epochal event. What greater gift could there be for Irish Americans than to see our forefathers and what befell them remembered for generations to come? Long ago and far away one million Irish died and one million fled in the greatest catastrophe of 19th century Europe. Probably no country has ever undergone such a massive transformation within such a short time, its future shorn off like a thatch roof in a big wind. Yet the great silence followed. The event was so traumatic that the Irish handled it the only way they knew how. They buried it deep in the collective memory. The years came and went and even independence did not resurrect the events. The 100th anniversary in 1947 passed almost unnoticed. But not any more. Great famine scholarship by historians such as Christine Kinealy, who inspired Lahey, new books on the topics such as “The Graves are Walking” by John Kelly, “The Atlas of the Great Irish Famine “by Cork University Press and “The Famine Plot” by Tim Pat Coogan which debuts in November means that the silence is ended. And the Great Hunger museum in Hamden, Connecticut, midway between New York and Boston secures for generations of Irish in America a place to go and see evidence of the catastrophic event where it all began for most Irish Americans. It is truly a defining moment and a magnificent museum for all of us. It is open to the public from October 11th.